With the eye of the global media now firmly trained on Iceland, this is a timely reminder of the power our restless planet has to disrupt our daily lives. With air traffic still grounded across much of northern europe, it is truly inconvenient to be a tourist stranded abroad, or to have cancelled a holiday or business trip. But in the grander scheme how serious is this really? European politicians are now awakening to the possibility of this inconvenience dragging on for days or even weeks and are now describing this inconvenience as a crisis. Now no one knows how this eruption will develop. But historical records describe how previous eruptions on Iceland had truly catastrophic impact on Scotland's climate and on the welfare of its people during the tenth to eighteenth centuries. 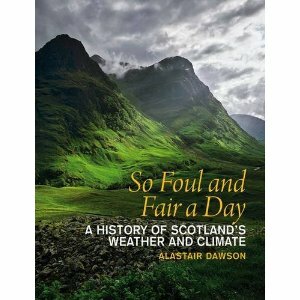 Below the fold are three excerpts from Professor Alastair Dawson's excellent book, So Foul and Fair a Day that gives an account of the impact of earlier Icelandic eruptions. Some of the most stupendous volcanic eruptions in Iceland took place some time between 934 and 940. The eruptions happened in the district of Eldgja in southern Iceland and nearly 220 million tonnes of sulphate aerosols were injected into the northern hemisphere atmosphere, which combined with water vapor to produce around 450 million tonnes of dilute sulphuric acid that was dispersed worldwide into the troposphere. The Eldgja volcanic vents stretch along a 75 km length of southern Iceland between Mt Katla and the Vatnajokull ice cap. The early settlers of Iceland must have been amazed by what was happening. Hundreds of square kilometers were covered by lava flows associated with 15 separate eruptions taking place over a 6-year period. Some of the columns of ash are thought to have been in the order of 14 km high. The sagas tell of the destruction of farmland, the abandonment of land. Some families are even described in the sagas as having attempted to rake the cover of volcanic ash from fields. No one knows for sure what the effects were on the weather of northern Europe. Some information can be gained from a similar, though less extensive, eruption of Laki in Iceland during 1783-84. It is well known, for example, that the years following this eruption were associated with the lowering of air temperatures across Northern Europe, the occurrence of dry sulphurous fogs and damage to crops and vegetation. From what we know, the Eldgja eruptions were twice as big as those of Laki. Thus we may expect that the effects on society were at least as severe as those associated with the Laki eruptions, which took place throughout the summer of 1783. Although hardly any historical accounts exist for this period, there are descriptions of drought in Ireland at this time, when the mountains of Connaught were burnt with celestial fire, and the lakes and rivers dried up. There is also an account for 941 of a great frost across Ireland and the freezing of rivers and lakes, but no information is available for Scotland. After another cold winter in 1689 to 1690 we enter the 1690s, associated by many with the lowest air temperatures throughout the period 1350-1700. Across northern Europe it was once again a time of dislocated society, population decline and abandonment of farmland. Scotland's climate was already in shock from freezing winter temperatures and wet summers when a series of volcanic eruptions took place. Mt Hekla, in Iceland erupted in 1693, depositing ash across much of Iceland and as far afield as Scotland and Norway. It is also well known that a major southward extension of sea ice took place at this time across the Northern North Atlantic. Whenever this happened, the tracks of storms were displaced further south than normal, leading to bitter winter winds and exceptionally high rainfall across Scotland. One night in the month of August 1694, a cold east wind, accompanied by a dense sulphurous fog, passed over the country, and half filled corn was struck with mildew. It shrank and whitened in the sun, till the fields seemed as if sprinkled with flour, and where the fog had remained longest - for in some places it stood up like a chain of hills during the greater part of the night - the more disastrous were its effects. From the unfortunate year till 1701, the land seemed as if struck with barrenness, and such was the change on the climate, that the seasons of summer and winter were cold and gloomy in nearly the same degree. The wanted heat of the sun was withholden, the very cattle became stunted and meagre. November and December, and in some places January and February, became the months of harvest, and labouring people contracted diseases which terminated in death when employed in cutting down the corn among ice and snow. Then things deteriorated even further. In June a major volcanic eruption started in the Laki area of Iceland. The eruptions became more extensive after late July 1783 and continued until January 1784. The effect on the weather of northern europe was immediate. Across Scotland, clear summer skies were soon replaced by a haze of dust and a sulphurous fog which obscured the sun for 3 weeks. In her diary from Kemnay, Aberdeenshire, Janet Burnett, unaware of the volcanic eruption, described how the leaves on the plants in her garden and the crops in the fields were withering yellow. In fact, the year became known in Scotland as "the year of the yellow snow". The magnitude of the Laki eruption can be gauged by its catastrophic effects in Iceland. approximately 53% of Iceland's cattle, 77% of the ponies and 82% of the sheep died, together with 20% of the island's population. The Icelanders seemed to be facing complete extinction. A committee was appointed in Copenhagen to devise means of relief. There was even a plan considered to evacuate the island and remove the entire population to Denmark. I am a geologist living in Aberdeen Scotland. So far the most noticeable impact is silence, with the busy airport closed, there has been no jet or helicopter traffic since Thursday. I am amazed by the amount of background noise caused by air traffic that we have become accustomed to - the silence is deafening. We had a light sprinkling of ash on cars on Thursday night and the occasional whiff of hydrogen sulphide. At some point, grounded helicopter traffic will begin to impact North Sea oil operations. Iceland is one of the most active volcanic regions on Earth, a hot spot sitting on the Mid Atlantic Ridge. The fact that it has been relatively quiet for years has perhaps led the public into a false sense of security. The volcanos on Iceland, including Eyjafjallajökull and its bigger neighbor Katla, have a different eruption pattern to volcanic arc / cordilleran type volcanos (e.g. Krakatoa and Mount St Helens) which tend to have spectacular but short lived explosive eruptions. Hot spot, oceanic volcanos tend to be less spectacular but erupt for prolonged periods of months to years. While no one knows how the Eyjafjallajökull eruption will develop, Europeans should not be surprised if the disruption goes on for several months and that the impact could become much more serious than disrupted air travel. Large eruptions in the past have made the climate cold and wet with detrimental impact upon harvests and livestock. So far this eruption is not large by historic standards and it may die down and stop. In the past, however, when Eyjafjallajökull has erupted it has woken its larger neighbour Katla. I suspect this story will be in the news for a good while yet. With much of UK airspace opened on 20th April, helicopter flights to North Sea oil and gas installations resumed Tuesday. However, the local press reports wednesday that helicopter flights were suspended again on Tuesday evening on reports that two helicopters had picked up ash contamination. As noted by Heading Out in this report, the distribution of ash is uneven and the potential for damage to aircraft may be quite unpredictable. With south westerlies due to take charge of the wether before the weekend it seems likely that Europe will get some respite while the ash cloud is diverted towards eastern Canada. For so long as Eyjafjallajokull keeps erupting it seems likely that we can expect sporadic disruption to air travel in Europe and much worse if Katla joins in. Eyjafjallajokull is still erupting but has subsided somewhat and with circulation restored to south westerlies, the "ash hazard" for Europe is reduced for the time being. One of the more interesting news reports this week stated that baseline data for interaction between aircraft, jet engines and volcanic ash does not exist. In other words, no one knows what exposure level is safe and the authorities followed the precautionary principal and decided on zero tolerance. The level of chaos caused to travelers was quite profound. Nate Hagens got stranded in Switzerland. My wife should have flown to Sweden last Sunday and obviously had to cancel. Tens of thousands of travelers have had arduous journeys home. The cost to the airline industry is over $1 billion. Finally some interesting perspectives on the risk of flying: Is driving more dangerous than flying through ash? Can't say I've seen any ash or smog in the French Alps (up till Saturday), or en route back to Scotland. It looks like the volcanic ash problem has been exacerbated by the bureaucracy over-reacting: for example UK airports being closed on Thursday morning when the ash had only reached the Faeroes. However, there is no doubt that if the current wave of Icelandic vulcanism develops into a repeat of 1783, it would be extremely nasty. For the Icelanders most of all, but Scotland is only 900km downwind. I agree that there seems to have been a degree of over - reaction. Though we are in the unfortunate situation of not really knowing. Coloured maps showing the distribution of ash mean nothing when you don't know what the ash particle densities mean. Companies now lack confidence in UK MET office - not least because they forecast a barbecue summer last year and a mild winter - we just had our coldest winter for 50 years, as I'm sure u know. Its reported that off shore workers were refusing to fly - so the perceived risks are real, what the real risks are is another question. I'm glad I'm not flying. Hi Nate, I think the cooling impact is mostly local to Europe. The ash and H2S is mostly in the upper Troposphere and will unlikely get circulated globally. In fact, it falling out over Europe is the problem with acid rains etc. As far as I'm aware climate models do not incorporate the impact of future volcanic eruptions, which of course they should do - nuff said. I suspect the weather in Switzerland is normal - lot of snow melting in mountains this time of year leads to high humidity etc - ask a Swiss. Scottish airspace open today - just heard a helicopter fly past. I think the cooling impact is mostly local to Europe. The ash and H2S is mostly in the upper Troposphere and will unlikely get circulated globally. What if it (and others) erupted/smoldered for much longer period of time? Big explosive eruptions send sulphate aerosol and ash into the stratosphere where it can be distributed globally resulting a a short lived alteration to global average temperatures. These Icelandic eruptions don't normally have the energy to send material into stratosphere. Instead the ash and aerosols get transported in upper troposphere and "cast a shadow". The dust and sulphate is quite quickly rained out. The problem for Europe arises if this goes on for several months, with periodic disruption to air travel. I think the airlines are on their knees. A much bigger eruption may result in really horrible disruption of european climate / weather as described by Dawson. I don't know if models have included volcanic activity either (though I'd be surprised if it hasn't been done) but the effects have been considered and are pretty well worked in to the big picture. The global impact of these Icelandic volcanoes is going to be small. As mentioned in the piece these types of volcanoes do not produce spectacular explosions that penetrate high into the stratosphere. In addition, these particular volcanoes are located at high latitudes so even if the plume sporadically penetrates into the lowermost stratosphere the Brewer-Dobson circulation will drive the ash and SO2 back into the troposphere. The lifetime of SO2 in the troposphere is much shorter than in the stratosphere due to convective mixing and scavenging. But even in the stratosphere the lifetime is less than two years as demonstrated by Pinatubo, which was ideally situated in the tropics and produced a globally dispersed SO2 layer. SO2 is very effective in forming droplets of sulfuric acid from even dilute H2O distributions such as those in the stratosphere (less than 6 ppmv) and these sulphate droplets proceed to grow and sediment. If only CO2 would do this. I see many mentions of "Sulfuric Acid" being formed in the atmosphere, but surely it would be "Sulfurous Acid", H2SO3. H2O + SO2 = H2SO3, not H2SO4. From my largely forgotten Chemistry education of 40+ years ago I seem to recall that sulfurous acid is much milder than sulfuric. Still not very nice stuff to breathe or have precipitated onto plants, etc. I could of course be wrong on this matter, but would appreciate clarification from someone knowledgeable on this subject. But also, SO2 can react with O2 in its presence, forming SO3 ( 2 SO2 + O2 -> 2 SO3 ) and that one reacts very vigorously with water forming H2SO4. So the question is, whether there are good enough conditions near volcanoes to form SO3 and if yes, what's the ratio between H2SO3 and H2SO4 in the mix? I am more concerned about what the acid rain from volcanic fallout does for compounding the rapid acidification of the oceans. Above all we are a water planet. 70%+ of the planet is covered with it and it is all becoming more acidic, becoming more detrimental to beneficial life forms, and more supportive of toxic. So no,the AGW issue is not going to all go away with a volcano blast. Good little BBC article how the $ (don't have the nifty pound symbol) value of human life varies from govt. policy to policy Euan, thanks for the link. It is my understanding that "this little volcano," Eyjafjallajokull, has produced basically no cooling sulfur-based aerosols because the SO2 gasses that would have generated them were absorbed by the overlying glacier and its melt-water (the "jokull" in the above name means "glacier"). If Katla or one of the other "sisters" has a major eruption, it will be another story, though probably a largely regional effect, for reasons pointed out above. Katla has been on a 40-80 year eruption cycle in the historical period. It has now been about 90 years since the last eruption. It this delay likely to mean a stronger than usual eruption when it does come? 'little volcano' was just meant to separate every eruption we have any historical record of from the really big ones. Last time Yellowstone blew big was about 640,000 years ago and about 1000 cubic km of of rock and dust blew into the sky. More recently Tambora blew out about 160 cubic km of material in 1815 and 1816 became known as 'the year without summer'. The really big ones must have a heck of a global impact. Still Katla's regional effect would be globalized quite rapidly as interconnected as things have become. "I'll be interested to see the psychology of those who are working to combat global warming: whether they'll be 'rooting' for a quick end to eruptions so a potential global cooling impact doesn't alter their thesis OR if they will be happy for some global cooling impact to offset greenhouse gas impact (which is the nominal goal)." OK, I'll lie on the couch for you. I "believe" that any serious person concerned about AGW would be happy if there was no AGW problem at all. Since there is an AGW problem, they would view volcanic episodes as AGW-neutral and a distraction in the discussion since the underlying issue has not changed. CO2 and other GHG's are still accumulating (pg 11) at the high end of model predictions. Serious folks working to combat AGW may however be disappointed if the general public believes that volcanoes solve something. My inner voice is telling me that we'll be riding out some pretty funky climate consequences, however it evolves. Best to err on the side of caution policy-wise and think long term. A serious problem with Icelandic ash is the potential for high fluoride content. The nice young vulcanologist lady explained the other night they were checking carefully. Highly toxic to grazing animals. Apparently the fluoride content varies with the particular volcanic eruption, and provides a useful signature for dates in environmental history studies. This earlier (Hekla) eruption appears to have been 'the big one' for northern Scotland - the region seems to have been uninhabitable for a while. We can assume this present one, even if Katla joins in which it is wont to do, is not in the same league. A summer though where air travel is restricted essentially unpredictably from time to time according to the weather, could make for interesting economic and political reactions. A 'volcanic winter' for a few years seems unlikely just now. Apparently tropical volcanoes have bigger potential for global cooling. Our present stuff will rain out. The literature on this sort of thing is pretty limited, and we can't really make more than a somewhat educated guess as to what is going to happen. There just aren't enough records avialable to use them as a sound basis of predicting the probability of further large eruptions, as I understand the situation from my admittedly limited reading in this area. The thing that I find the most curious about the records is that more accounts of the weather disruptions have not been unearthed.There were monks and monasteries, or at least solitary monks in that part of the world, there were kings and nobles of a sort, etc. T he nine hundreds are easily understood, literacy was rare and records would have been lost over a thousand years time, but the last three or four centuries would seem to be better recorded and preserved. I will hazard a guess that the field is a ripe one for some young researcher with the enthusiasm and determination to really get in there and dig. I'm not a conspiracy nut, and that doofus novel The Da Venci Code involving the Vatican that sold so well a year or two ago was a total crock. But the Vatican library would be a great place to start. More than likely the historians who have actually examined such original sources as are still extant did not know what to make of seemingly irrevelant comments about the weather, etc, in documents about other subjects, and therefore simply did not follow up. I am interested because I once lived in Iceland back in the mid '70s when my father was stationed at the US Naval base there. A wonderful country, it is still on my list for retirement places, and I would love to vaction there. Not going to anytime soon as I am not that well off moneywise, Living on less than $9,000 US. Hopefully we all will learn something positive about all this. That we can't predict the future, and we should be mindful of the things that could happen when we least suspect them. Designing Food and Home living systems, I always point out that weather can do favors for you, or ruin your day. Though a volcano is not weather it falls under the heading of natural occurances that we can't control, like earthquakes. No one I have helped so far is in areas prone to these events, but I do give advice online and you never know who might read it. Much thanks for the reporting. I think in Europe we tend to see natural disasters as things that happen in other parts of the world. The Mediterranean area is active with a couple of volcanoes in Italy, and Iberia also prone to occasional earthquakes. But we have tended to forget about hazards posed by the proximity of Iceland. This is obviously not something worth losing sleep over. But a large eruption on Iceland could wreak havoc throughout NW Europe, and there is absolutely nothing we could do about it. If this eruption causes cooling over the U.K. this spring and summer, will the U.K. have enough natural gas to keep warm after their supply problems last winter? So I guess we should all be praying for more volcanoes to reduce CO2 levels or be grateful for this one for the reduction that has occurred. I'm just being sarcastic. None of us want to give up the pleasures of this modern age of flight. We just want the poor to start walking, ride a bike, or freeze to death in their little houses because coal puts out too much CO2. We want to save the planet as long as we can continue to enjoy the pleasures of our modern age. Damn volcano! "So I guess we should all be praying for more volcanoes to reduce CO2 levels or be grateful for this one for the reduction that has occurred." They will just delay the consumption of a large but finite resource and this one delayed some of the consumption a few days. I guess we will need a few of them running continuously to change the consumption behavior. What really was brought home to me was how routine, how interwoven, air traffic has become. Instantly I knew of a couple of people who were affected, within a few days several more. Issues arose related to my job as well. I wonder if Europe will follow up with the reexamination of its supply and transport lines? I do not think the US will think about it at all. Still no flights to/from Iceland's main international airport today. A few flights are still able to use Akureyri airport for the moment though. A second, more gigantic, ash cloud eruption from another Icelandic volcano named Katla is now “probable” a catastrophe modeling firm is warning. That caution came today from Risk Management Solutions in Newark Calif. just as air traffic disruptions were easing after the ash cloud from Eyjafjallajökull volcano in Iceland began dispersing. In addition, RMS said that Eyjafjallajökull eruptions may worsen again and could go on for years. The days of halted air traffic were expected to create millions in passenger travel insurance claims and possibly others related to other segments, although the event was generally not seen as covered by business interruption policies. Three previous eruptions of Eyjafjallajökull are known in the last 1100 years (historical time in Iceland). The most recent began in December 1821 and lasted intermittently for more than a year. The neighbouring volcano Katla erupted then on 26 June 1823. Other eruptions include an eruption in 1612 or 1613, and about 920 A.D. Note 18 month lag from eruption of Eyjafjallajökull and Katla. He said that the ash in Eyjafjallajökull was much lighter than the ash is normally in Katla and in other Icelandic volcones. So there is no reason to panic, yet. So even if a Katla eruption will follow the current eruption there is a possibility that the ash will not do as much harm. I also seem to remember that some geologist said recently that the Katla eruptions that have followed the last 3 eruptions in Eyjafjallajökull have been rather small. I also want to mention that we had a sub-glacial eruption in Gjálp in Vatnajökull Glacier in 1996. The eruption was about 4 times larger than the current one. Didn´t ground many planes as I recall. The ash was much heavier. Had a jökulhlaup though (huge floods). My biggest worry is an eruption in the volcanoes just outside Reykjavik as I live in that city. Some are just a few km away from the city. The lava could destroy some suburban neighbourhoods. One day there will be a huge eruption in Iceland like Laki in 1783 (we call them Skaftáreldar in Iceland. Skaftá is a name of a river in the area and eldar means fire) or Eldgjá in 994. We have to be ready for that. I just hope I will not have to deal with a catastrophe like that. Thanks Muninn. The ash particle size will obviously be very important. I suspect that fine ash was erupted from Eyjafjallajökull owing to glacier melt water entering the vent and its evaporation providing more energy to the eruption creating fine ash. I suspect you are probably right and that Eyjafjallajökull will be a one off for this generation. I believe the reason for grounding the planes is to avoid collisions with other aircraft in flight. To conserve fuel, the altitudes that planes fly were lowered. With the large number of fights in the air, crowding between planes has become a problem. If the planes flew through a cloud of ash, the engines might stall on some of the planes. This would force some of them to glide. With limited control of a gliding aircraft, this would pose a serious danger since they would not be able to fly in their proper lanes. Ram air turbines (RAM) provide limited power to the planes in case the engines loose power. Turbofan engines have a sparker in the combustor that runs continually. This is a safety feature. The engines would start as they exit the cloud because the rotors are still turning and the spark will ignite the fuel. Another thing is that the radar which these sophisticated aircraft use to maintain proper station would not perform properly, as in a fog. The radar also instigates the warning system for the pilot so that a collision can be avoided. Cruising along at 600 mph does not allow the pilot by sight to react if another plane is on a decreasing range and constant bearing. Radar is vital. The impact of the ash occurs on the first stage of the compressor. Modern turbofan engines are designed to run with a limited number of blades missing. The modern turbofan is very rugged. I believe that most of the garbage could be passed through the engine. As for the velocities entering the engine, the ram effect would occur only at the first stage of the compressor. The velocities at the last stage of the compressor would be low since the compressor packs the air against the combustor. Compressors change the velocity head to a pressure head. Velocities increase as the fuel is burned in the combustor and exit the wheels of the power turbine. These turbines spin at around say 20000 rpm and I doubt for the time the plane is in the cloud silicone would have time to deposit on the wheel of the power turbine. However, if this did occur and serious vibration did occur, the engine is designed to fall from the wing. The transatlantic planes 777, 767, 757 are designed to fly with one engine. FAA rule. Even the 737’s will fly with one engine. You have a very appropriate name idontno. idontno, please read Heading Out's article of April 20 about jet engines. The effects of this ash can be catastrophic. Having flown jets for over twenty years, I tend to agree with his assessment. If the airline industry didn't have good reason, they would not cancel flights. One mishap might be millions of dollars in liability especially since they were warned and the cost of jet engines is not insignificant. I wonder what TOC thinks a worst-case-scenario would have in terms of delaying peak oil? If eruptions continue intermittently for years, does the potential exist for entry into a demand destruction scenario where depressed economic activity pushes peak oil effects off one more time? Would the potential loss of all air-transportation deal a such a crippling blow to the EU, or is the danger more muted? It seems the event is not over, just a change of wind direction. These sorts of things can continue for a long time. If we are patient we will will find out what happened for real not some blind prophecy or WAG. It seems the event is not over, just a change of wind direction. It is more than that. It doesn't have quite as easy access to water as it did a week ago. It was the explosive mixing of water and lava that was causing the copious ash. Now, it will still produce ash, but not nearly as much, and not injected as high up. Still could be enough to cause a nuisance, as Scotland saw this week. But, unless the eruption gets worse, you probably won't see continent wide airspace closures. Well pardon me. Since I hold an A/P license and two engineering degrees I think I'm qualified to talk about these things. Of course I know pilots are much more knowledgeable since most have to led to the cockpit. Regardless of your airframe/powerplant ticket as well as your engineering credentials, you could still be wrong. As it happens, the statement you made previously about transatlantic jet traffic being cancelled due to logistical issues (aircraft spacing) as opposed to the possible damage to engines doesn't seem to make much sense. Though I am ignorant about engineering and jet engines, I do understand that if large amounts of volcanic ash get past the intake of a jet engine, it is going to turn that jet into a glider pretty quickly. Also, your snark about pilots having to be led to the cockpit was unneccesarily rude. Not only will the jet turn into a glider, the jet's windshield becomes opaque in direction proportion to the amount of ash flown through. So you then have the thrill of trying to land by looking out the side cockpit windows. Link to a cool animated map of global air traffic patterns. And in a frank interview with The Sunday Telegraph, the country's president, Olafur Grimsson, a plain-speaking left-wing academic, cited new research by Icelandic volcanologists to warn the country's neighbours to expect more intensified volcanic activity for decades to come. "The fundamental lesson is that volcanic eruptions will continue to happen in Iceland so we'll all have to learn to live with them and handle them better," he said. "We should treat the events of the last few days as a dress rehearsal for what needs to be done if and when Katla erupts. "There really need to be extensive plans to deal with these eruptions so that we don't see this sort of chaos and bewilderment and surprise again." The smoke and ash are really rock and glass in talcum powder form. It would most certainly be detrimental to a jet engine. it would clogg up the engine in short order. these engines cost millions of dollars, and most likely would be unable to overhaul, and the plane would drop like a rock from the sky. It isn't rocket science! and i am a A&P mech. Are you claiming they can't be flown and must 'drop like a rock' as was clearly not the case with the Grimli Glider :-) --- just joshing since jets are really bricks kept airborne with qazillions of pounds of thrust with zilch glide ratios. Amazing pilot with some not usual skills averted tragedy. Are you claiming they can't be flown and must 'drop like a rock' as was clearly not the case with the Grimli Glider :-) --- just joshing since jets are really bricks kept airborne with qazillions of pounds of thrust with zilch glide ratios. "The aircraft flew into a cloud of volcanic ash thrown up by the eruption of Mount Galunggung (approximately 180 kilometres (110 mi) south-east of Jakarta, Indonesia), resulting in the failure of all four engines. The reason for the failure was not immediately apparent to the crew or ground control. The aircraft was diverted to Jakarta in the hope that enough engines could be restarted to allow it to land there. The aircraft was able to glide far enough to exit the ash cloud, and all engines were restarted (although one failed again soon after), allowing the aircraft to land safely." There was a dramatisation of the incident in the TV series "Air accident investigations".